The organisers of the 24th annual Fethard Book Fair – taking place on Sunday February 10 – have chosen ‘Daughters of Dún Iascaigh’ as their ‘Tipperariana Book of the Year, 2018’. The award was presented to the Cahir Women’s History Group in the ‘O’Connell Memorial Hall’ in Fethard, better known as the ICA Hall, at a ceremony on Friday night last, January 25. The four editors of the book, Josephine O’Neill, Karol DeFalco, Mary Caulfield and Breeda Ryan were present to receive the award, along with many other fellow book contributors and family members and friends who were acknowledged for their great achievement. ‘Daughters of Dún Iascaigh’ is a beautifully produced book, which in its 300 pages recounts the history of the women of Cahir from the very earliest times. Present on the night also was renowned artist Alice Maher, another daughter of Cahir whose artwork adorns the cover of the book. At the reception, Alice read ‘Women of Cahir’, a very evocative poem from the book. The poem is in effect a distillation of the many stories of the women mentioned in the book. Mary Hanrahan, chairperson of the Fethard Historical Society (organisers of the Tipperariana Book Fair), welcomed everyone to the ICA Hall which was a very appropriate venue given the subject matter of the 2018 winning book. Indeed, as mentioned in Daughters of Dún Iascaigh’, when the ICA was formed in Cahir in 1944, Fethard ICA ladies went to Cahir to advise and support the setting up of their new guild. 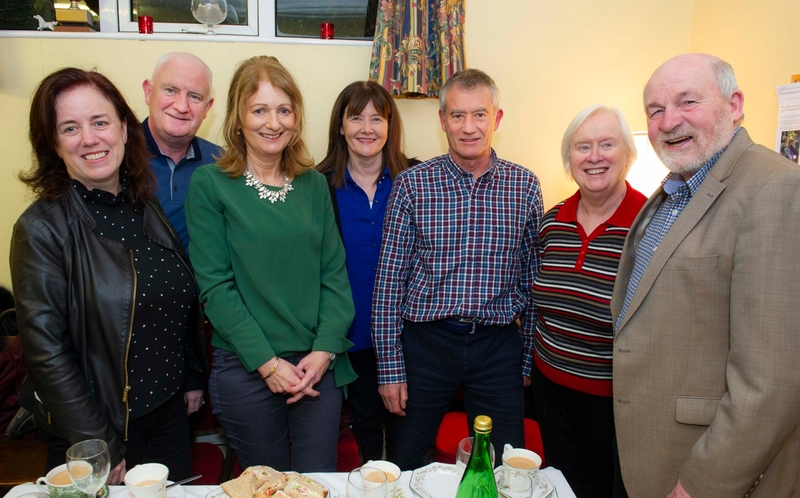 Photographed at the presentation of the Tipperariana Book of the Year Award for 2018 were from left to right: Annette Condon, Billy O’Neill, Ann Coffey, Mary Byron, Seamus Byron, Marie O’Connor and Nathaniel Bourke. Terry Cunningham, of the Historical Society, gave a short outline of the origins and name of the ‘Tipperariana Book Fair’ and how the tradition of inviting authors of ‘Tipperary’ books to come to the fair led on to the idea of a ‘Book of the Year’, which is now an accolade much appreciated by the authors of the winning books. Mary Hanrahan then reviewed ‘Daughters of Dún Iascaigh’, commending the editors for the skilful combination of diverse voices telling the hitherto hidden stories of the women of Cahir. The tales told range across the centuries from that of Badamair in the Book of Leacan right down to the 1950s. These stories have resonance, not only for the people of Cahir, but also nationally and internationally. Mary also praised the use of factual narrative to relate often highly emotional content while eschewing unwarranted sentimentality. The four editors of the winning Cahir book then each received a specially commissioned ‘ceramic piece’ by local artist Dóirín Saurus. Josephine O’Neill spoke on behalf of the Cahir Women’s History Group and said how happy they are with the enthusiastic reception that the book has received and how it has sold out completely. However, a new print run will arrive in time for the Fethard Book Fair on Sunday, February 10, when the ‘Daughters of Dún Iascaigh’ will take pride of place at the 24th Tipperariana Book Fair.